CAIRO and PARIS – April 18, 2016 – GE (NYSE: GE), today announced that it has signed a contract worth approximately $250 million with the Egyptian Electricity Transmission Company (EETC) to provide the company’s advanced grid solutions technologies to substations located in Mostathmereen, Beni Suef Industrial, Ismailia East and Temay Alemdeed. These four Gas-Insulated Substations (GIS) will help connect 7 gigawatts (GW) of power to the national grid, which is the equivalent to the electricity needs of more than 6.5 million Egyptian homes. This will be crucial to reinforce Egypt’s network during periods of peak demand. 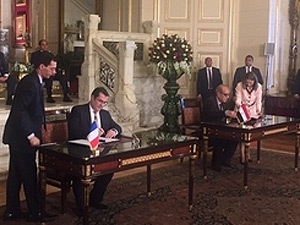 This contract is part of the Protocol of Cooperation signed during the French Presidential visit to Egypt, highlighting the importance of this project to Egypt’s energy sector. His Excellency President François Hollande and His Excellency President Abdel Fattah El Sisi, witnessed the signing, among other agreements between the two countries to further support Egypt’s economic, industrial and infrastructural development. French components make up approximately 50% of the total project scope including the GIS technologies to be installed at the substations which are manufactured and assembled in France. The project is being executed in a consortium with Rowad Modern Engineering, a leading Egyptian contractor, for the construction work of the substations. Furthermore, the project is expected to create approximately 50 permanent jobs and 1,000 indirect jobs for Egyptians during its execution. The first phase, which includes the Mostathmereen substation, will be connected to the grid within six months; and the remaining three substations will be completed by the end of 2017. As part of the contract, GE will also supply a digital data protection system, network management system and telecommunication technologies, which will help connect the substations to the National Energy Control Center and improve the network’s stability. The installation of GE’s GIS will offer several solutions for Egypt’s grid including smarter networks, condition-based maintenance and greater load control to prevent outages. For over a century, utilities around the world have relied on GE to deliver products and services to increase energy security, and improve grid resiliency and responsiveness. With more than 135 advanced gas turbines installed in Egypt, GE helps generate more than 14.8 gigawatts of electricity today - enough to power more than 14 million homes nationwide.